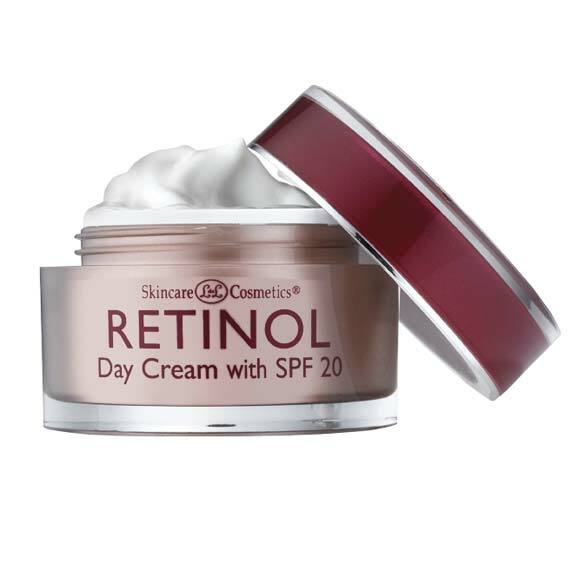 Skincare Cosmetics® retinol day cream with SPF 20 sunscreen moisturizes with aloe vera for firmer, younger-looking skin. Anti aging skin cream is fortified with 400,000 I.U.’s Vitamin A and grape seed extract for a luminous, even-toned complexion. 1.7 oz. Day Cream: Water (Aqua), Glycerin, Cetearyl Alcohol, Petrolatum, Glyceryl Stearate, Retinyl Palmitate, PEG-40 Stearate, PEG-8 Stearate, Stearic Acid, Diazolidynyl Urea, Carbomer, Methylparaben, BHT, Xanthan Gum, Propylparaben, Chitosan PCA, Tocopheryl Acetate, Triethanolamine, Fragrance, Silk Amino Acids, Tetrasodium EDTA, Ascorbyl Palmitate. Day cream: Use daily on clean, dry skin. Apply liberally 15 minutes before sun exposure and as needed. Children under 6 months of age: ask a doctor. Reapply as needed or after towel drying, swimming, or sweating. I AM 81 YEARS OLD AND HAVE BEEN USING THIS PRODUCT FOR A YEAR NOW AND MY FRIENDS COMPLEMENT ME ALL THE TIME ON MY COMPLEXION AND QUITE OFTEN ASK ME WHAT PRODUCTS I USE THAT KEEP ME LOOKING SO YOUTHFUL.. I am a budget buyer, however I stick with product brands that work for me and I search for the best price. This was the lowest price for this item - I was very happy! love this product.it works all daybeen using a long time.it sure made a difference.i buy somewhere else becaue its cheaper. My skin face feels fresh all day. I have been using these cream for several years and I can see the change in my skin that has improved over the years. Good value for a Vitamin A product. This is part of the product line I use and it works. Wrinkle reducer, skin brightener and the day and night cream. I saw a definite difference in my skin after the first week. You should use all of the products as I think they work together in supporting a positive skin regimen. I am a senior and people compliment me all the time about what beautiful skin I have. I bought this item because the reviews was rated 5 star. Works very well and improves appearance of facial skin tissue. This is the second order for this product. It is inexpensive and easy to apply. The results are very pleasing. I love fresh looking skin daily. Does it take care of turkey neck? BEST ANSWER: Thank you for your question. The Retinol Day cream is made to help only remove wrinkles on the face and neck. We hope this information will be of help to you.